Gwyneth Wentink is an internationally acclaimed harpist, cultural entrepreneur and arts advocate working across any genres and roles. She is director and founder of State of the United Arts, an arts think tank and performance platform which produced Canto Ostinato Audio Visual and the currently touring audiovisual performance In Code. Canto Ostinato Audio Visual has toured extensively in The Netherlands and in many cities as Tokyo, Sydney, New York and Moscow, and was chosen for the ‘Kingsconcert’ of King Willem Alexander and Queen Maxima of the Netherlands as well as for a performance during their recent state visit to Canada in 2015. As a harpist both classical and experimental, Gwyneth Wentink has performed at world’s most prestigious stages as Carnegie Hall and Lincoln Center in New York, the Royal Albert Hall and Royal Opera Hall in London, and the Konzerthaus in Berlin, among others. Many of today’s leading composers have written works for Gwyneth including Theo Loevendie, Marius Flothuis and Terry Riley. 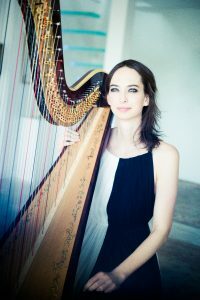 Wentink holds a position as solo harpist of the Orchestra Revolutionaire et Romantique and the English Baroque Soloists under Sir John Eliot Gardiner. Praised for her versatility, Wentink introduced the harp into classical Indian music, and plays regularly with greats like Pt Hariprasad Chaurasia. Why do you think students should come to Codarts? "Codarts offers a dynamic learning environment. It's a confluence of many genres, stimulating the artist's curiosity and imagination. Music, dance, research and even acrobatics; there's a lot to discover! The music department is known for it's adventurous spirit with deep roots in classical, jazz and other western disciplines. And the world music department is legendary. So much stimulation and inspiration for artists to find their expressive voice." "To connect, to listen and experiment. With a harp class strongly rooted in classical music we'll explore one's imagination and curiosity, connecting to disciplines and artists in- and outside the school. Tone forming is key in a proces where students will be prepared for a profesional career through solo, ensemble, orchestra, improvisation and pedagogy classes." "Focus on the students ability to listen and connect. To themselves and the world around them. Discovering their mind-body relation behind the instrument and navigate through a wide curriculum of harp repertoire strongly rooted in western classical music from early music (triple harp) to experimental contemporary repertoire to non western music and other disciplines that sparks the students interest!" Wentink has won numerous prizes, including the Dutch Music Award, the highest distinction awarded to musicians in The Netherlands in 2007, the Israel Harp Competition and the Young Concert Artists Auditions in New York.